« *** WINNERS *** Nadine and Danielle are Living the Life of Riley! CONGRATULATIONS! I love to travel! Visiting new and exciting places, eating at different restaurants, shopping at unique stores and staying in hotels, all add up to a wonderful adventure, in my opinion. But, I also love to travel because, believe it or not, I enjoy using the cool luggage pieces I have and looking organized and stylish while on the move. I've got many different bags and travel accessories that I admire, but I have always been searching for a versatile and fun carry-on bag, which could easily double as a weekend or overnight bag. Miss Lucy's Monograms carries a large variety of personalized items and I was fortunate enough to have the opportunity to review one of their large travel bags with wheels. Keep reading to learn much more! 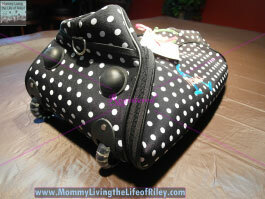 I reviewed the Black and White Polka Dot Large Monogrammed Travel Bag with Wheels from Miss Lucy's Monograms, which retails for $44.00. 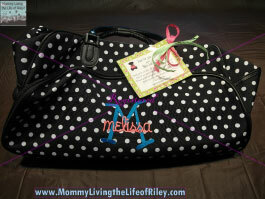 I was so very excited to receive the Black and White Polka Dot Large Monogrammed Travel Bag with Wheels from Miss Lucy's Monograms for it was just TOO CUTE! The one thing I've noticed when shopping for larger travel bags is just how expensive and how boring they all seem to be. Well, at Miss Lucy's Monograms, boring is definitely NOT her thing! The large travel bags she offers are all very feminine and will definitely catch your eye. Personally, I chose the Black and White Polka Dot Large Travel Bag with Wheels since I am a huge fan of polka-dots and I love when black and white colors are paired together. As you can see from the picture below, I chose the Overlap design with hot pink and turquoise threading. I think the personalization really pops against the black and white background and makes this travel bag feel like a "Melissa Original"! I think this large bag is fun and flirty and definitely much better than a stuffy old plain carry-on bag. What really surprised me though was the level of quality I received in the large travel bag itself. To be honest, when I found out that this bag with personalization only cost $44, I didn't think it was going to be of a very high quality, but this couldn't have been further from the truth! This wheeled duffel bag is durable and well-made and has all the bells and whistles of a typical carry-on bag, but costs half as much. 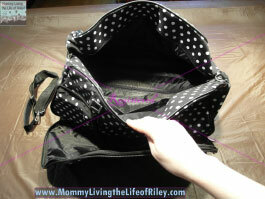 The large travel bag from Miss Lucy's Monograms measures 20" W x 12" H x 12" D and seemed very roomy and well-designed. This bag is made from durable canvas and contains an adjustable shoulder strap, a retractable pull handle and stylish clear wheels. I really liked how the handle could be concealed inside the small zippered pocket on the side of the bag too. There are also four black floor guards on the bottom of this bag, as well as two more on the side so that your bag will stay protected and clean at all times. There is a large zippered outer pocket, perfect for storing your books, magazines, newspapers or other reading material when you travel. On the opposite side of the bag is a smaller zippered pocket which is great for keeping your ID, money, cell phone and passport, so that you can access these items quickly and easily. I'm so happy that now I have a very stylish and personalized wheeled travel bag to take with me whenever I have the chance to spread my wings! These large wheeled travel bags would also make an absolutely lovely Mother's Day gift for any woman you know who likes to travel. At Miss Lucy's Monograms, you will receive a top quality product with gorgeous personalization options included for FREE! I highly recommend this company and the wide variety of products they offer! Disclosure: I received the Black and White Polka Dots Large Monogrammed Travel Bag with Wheels from Miss Lucy's Monograms in order to facilitate my review. No other compensation was received. This product review is based on my own personal experiences with this item and is completely honest and objective.